Let's say you come across a licensing opportunity on our Wanted Listings which is asking for an acoustic guitar, mid-tempo track à la Singer/Songwriter, Richard Thompson - Instrumental Only. Awesome! You just happen to have the perfect track...only it contains vocals. Perhaps by the time you have contacted the producer to obtain stem mixes or instrumentals, the deadline for submission passes. This is a disappointing and possibly stressful scenario and one we would like to help you avoid. Having any additional files uploaded and ready to go is heartily recommended to take advantage of any opportunities which come up. Apart from showing buyers, you take your business seriously by being prepared, you are able to fulfill any such requests without stress. It's important to know that Buyers often need alternative versions in addition to the full version of a song to fulfill the project's needs and being unprepared could jeopardize a licensing opportunity. Clicking Public View is a great way to see what information will be displayed to the public. 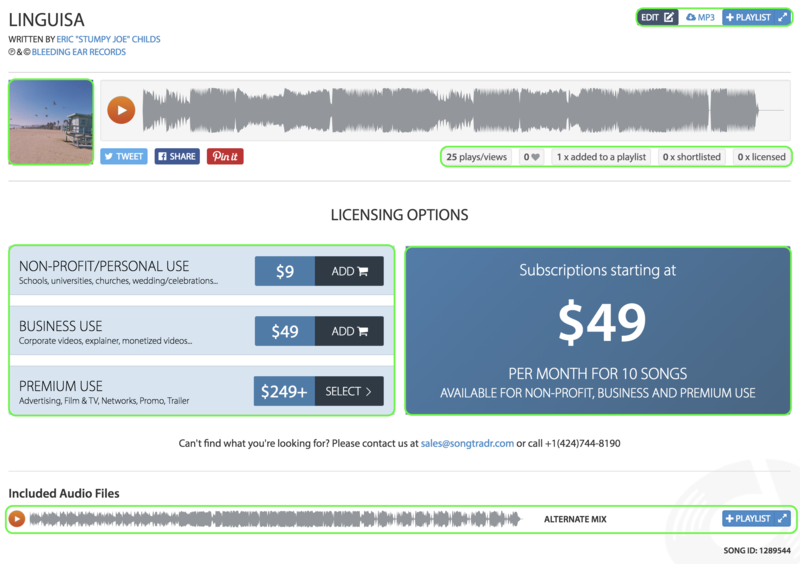 From here you can EDIT, add to a +PLAYLIST, view your song icon (default is the Songtradr icon), view current stats, pricing offered and Included Audio Files.